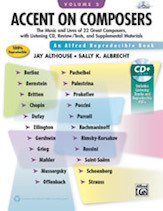 Introducing another volume of Alfred Music's most popular reproducible book! PDFs of the entire book are included on the enhanced CD. Includes lessons, assessments, and professional recordings for Berlioz, Bernstein, Britten, Chopin, Dufay, Ellington, Gershwin, Grieg, Mahler, Mussorgsky, Offenbach, Pachelbel, Palestrina, Prokofiev, Puccini, Purcell, Rachmaninoff, Rimsky-Korsakov, Rossini, Saint-Saens, Schoenberg, and Strauss.